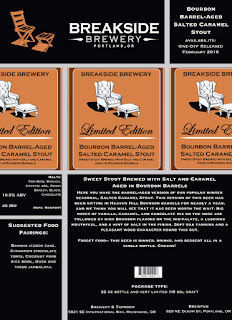 Portland & Milwaukie, Oregon - Fresh off a recent Gold medal win for Breakside IPA at the Best of Craft Beer Awards and winning the Oregon Hophouse's month-long Blind IPA Tasting, Breakside Brewery is introducing two very special new beers in bottles straight from the barrels with Bourbon Barrel-Aged Salted Caramel Stout and Fitzcarraldo. Both beers will take their bow on Zwickelmania day, February 13th, 2016. 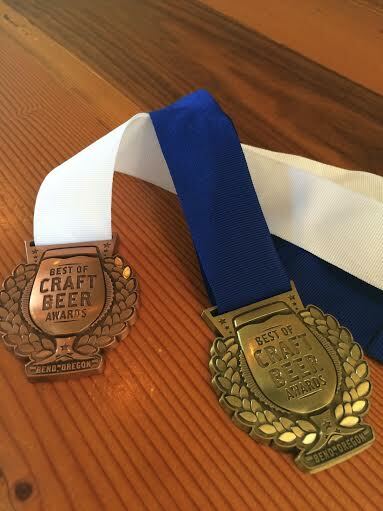 Between the Best of Craft Beer Awards and another recent win at the Oregon Hophouse's month-long Oregon Blind IPA Tasting, Breakside IPA is solidified as one of the winningest IPAs on the market today-- it is the ONLY IPA to have won gold at 3 of the 4 largest beer competitions in the country (North American Beer Awards 2014, Great American Beer Festival 2014, Best of Craft Beer Awards 2016). 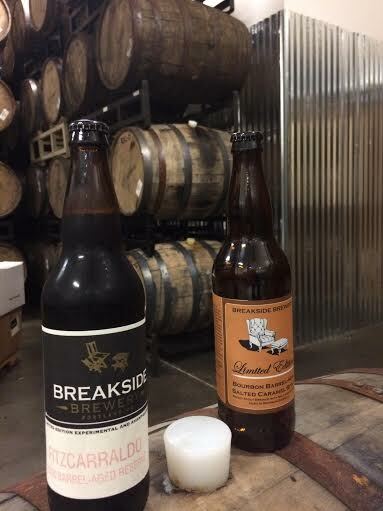 Breakside Brewery will be debuting two new barrel-aged beers in bottles on Zwickelmania, Saturday February 13th, 2016. 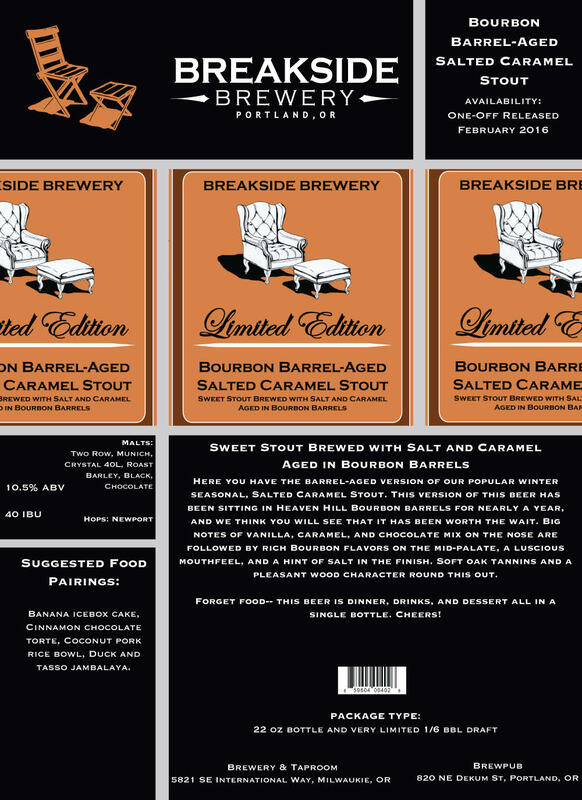 The first ever release of a special Bourbon Barrel-Aged Salted Caramel Stout that will go on sale on Friday and then trickle out to limited distribution. 22oz bottles will be on sale at both Breakside locations for $13 each with a 6 bottle per person limit beginning at 11am. Fitzcarraldo is a special barrel-aged blend that Breakside's Head Brewer says "Frankly, it tastes amazing. Easily one of the most robust and complex barrel-aged beers we've ever done." 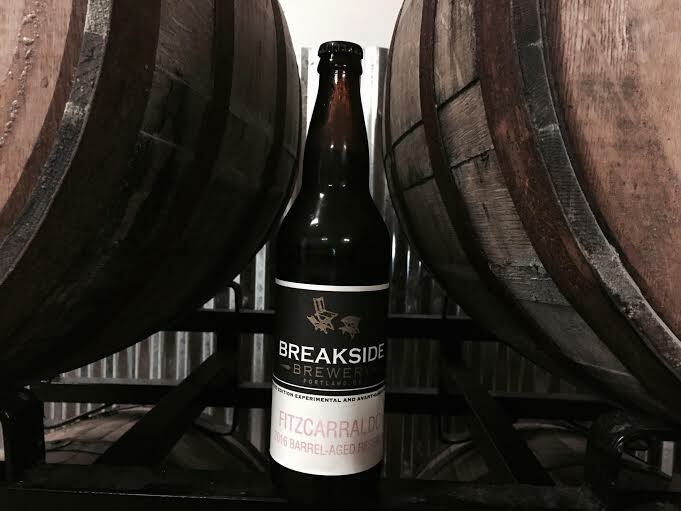 Fitzcarraldo will only be sold in-house at the two Breakside Brewery locations with very limited draft sold outside for special events. This beer will also debut on draft and in bottles for $13 each this Zwickelmania day, Saturday, February 13th. More info on both beers below. Also on Zwickelmania day, our Milwaukie Brewery & Tasting Room will be pouring our collaboration beer with Honolulu Beerworks-- Side Project Sour-- which is a berliner weisse made with calamansi lime and Maui gold pineapple. 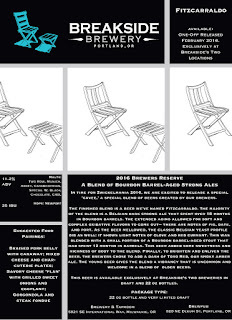 There are only 2 kegs of this beer that made it into Oregon, one of which will be tapped on Saturday. In time for Zwickelmania 2016, we are excited to release a special 'cuvee,' a special blend of beers created by our brewers. The finished blend is a beer we've named Fitzcarraldo. The majority of the blend is a Belgian dark strong ale that spent over 18 months in Bourbon barrels. The extended aging allowed for soft and complex oxidative flavors to come out-- there are notes of fig, date, and port. As the beer mellowed, the classic Belgian yeast profile did as well: it shows light notes of clove and red currant. This was blended with a small portion of a Bourbon barrel-aged stout that had spent 12 months in barrels. This beer added some sweetness and richness of body to the blend. Finally, to brighten and enliven the beer, the brewers chose to add a dash of Toro Red, our smoky amber ale. The young beer gives the blend a vibrancy that is uncommon and welcome in a blend of older beers. 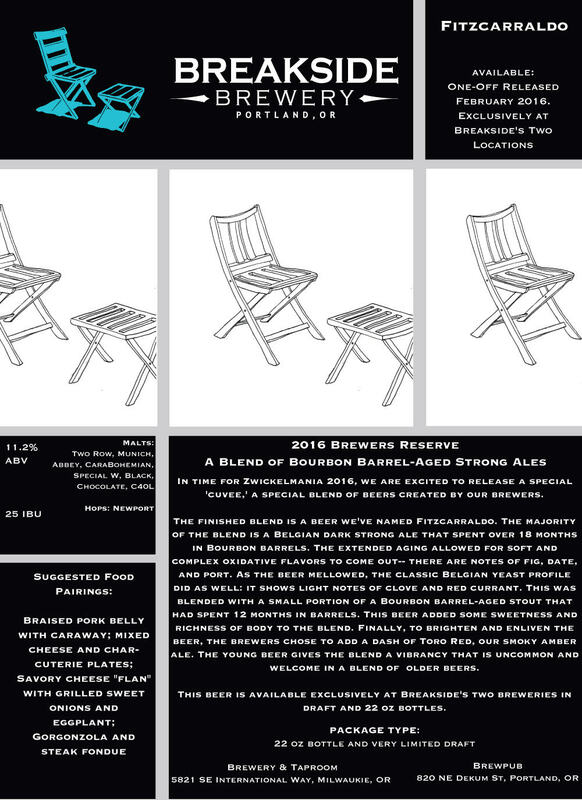 This beer is available exclusively at Breakside's two breweries in draft and 22 oz bottles. Here you have the barrel-aged version of our popular winter seasonal, Salted Caramel Stout. This version of this beer has been sitting in Heaven Hill Bourbon barrels for nearly a year, and we think you will see that it has been worth the wait. Big notes of vanilla, caramel, and chocolate mix on the nose are followed by rich Bourbon flavors on the mid-palate, a luscious mouthfeel, and a hint of salt in the finish. Soft oak tannins and a pleasant wood character round this out. Forget food-- this beer is dinner, drinks, and dessert all in a single bottle. Cheers! Suggested Food Pairings: Banana icebox cake, Cinnamon chocolate torte, Coconut pork rice bowl, Duck and tasso jambalaya.